If the feathery type is your vice, you must add the last Sunday of every month from 10-11am at the Birdlife Discovery Centre. It’s all about free bird watching, mingling with like minded fluttery fans and trying to take a snap of that rare breed before it vanishes. For kids who love insects, creepy crawlies and the slippery type, on the 3rd June and 5th August, the Bicentennial Park will host a Frog & Tadpole Study Group event. Learn all about these hop-alongs from their leg muscle leaping abilities to eye vision and natural habitats. The events take place from 7-9pm. Sweeter than cupcakes may be a delicacy you can never resist. If so, you must sign up for the Cake Bake & Sweets Show from the 3rd - 5th June, 10am-5pm in the Sydney Showground. Sample, buy and hoard a few tasters while you stock up on the sugar, purely to keep your energy levels up…right? How about all you nature lovers? On the 28th August from 10am-12pm, head to the Education Centre, Bicentennial Park and venture into a series of short walks on urban ecology. Learn about wildlife, nature’s incredible eco systems and the soil crawlies that regurgitate the land for plant growth. Later on this year (dates to be announced), are the free Kids in the Park & Sand Art Fun. These will most likely be scheduled during the winter holidays. The Park events will include everything you expect to exhaust the little ones, hoping they’ll sleep a good 12 hours that night (we can only pray). From games to attractions, food, exhibition stalls and rides, it’ll all be in abundance. The Sand Art is a brilliant way for kids to learn how to build, craft within team work and thrive off their innovation skills. With a huge pit of sand at their disposal, they’ll enjoy hours of fun from creating, completing, demolishing and starting all over again. Remember to tweet the Park and our hotel with your kid’s outstanding sand results. Only 38 minutes by car or 1.15 hours by bus, you can be back at Cremorne Point Manor. Keeping with the free theme, chill out at our balcony overlooking the “doesn’t cost a penny” stunning views of the Harbour skyline. 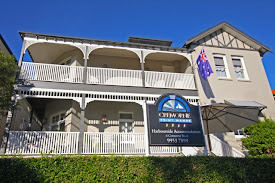 You’ll also keep your purse strings intact with the most affordable hotel rates in the area, at Cremorne Point Manor. Sometimes the best things in life are free…or budget friendly. If you’re heading to Sydney around the early part of next month, you must check out World Laughter Day at Bondi Beach on the 1st May. Not only is laughing holistic, infectious and lowers blood pressure but it uses so fewer facial muscles than frowning…and it’ll start tightening up a potential six pack. If you have the latter, by the 2nd May you may be leaning towards a 12 pack. On this hysterical day, you can learn about the benefits of happiness, health and good ole tear jerker laugh…all through the power of yoga. This free event is hosted by the Bondi Beach Laughter Club and at 11.30am, be ready on the beach for registration. Thirty minutes later the introductions, announcements and kudos speeches will take place. From that time on until mid afternoon, you can take yoga sessions, laughter meditation (it’s hysterical – we’ve tried it), relaxation techniques, confirm positive affirmations and then bond over Bondi team games. There’s also an introduction about Laughter Yoga and the incredible benefits it gives to mind, body and soul. It’ll make your hair grow healthier, your nails stronger, reboot your major organs and ensure that chi is flowing like a river. The yoga session is followed by drinks, meeting new people, reacquainting with long lost friends and an increased volume of high energy levels. You can book free event tickets through Eventbrite, listed on their website. All you need to do is bring a yoga mat or beach towel but if you don’t have that, then simply lay in the sand and let it absorb all the negativity & stress you’ve built up recently. If you want to know more about how the Yoga Workshop will play out, here’s the scoop: The trainers will educate you on deep breathing exercises and the great multitude of benefits that laughter brings to your life. They include rhythmic clapping, grounding exercises and strategies on incorporating these in your everyday life. If you’re in Sydney on 25th April, what better way to feel patriotic towards veterans than the ANZAC Day March. Honoring those who have served to defend Australia or related interests, this is a special day to pay respects for those who have suffered as a result of their service. As a solemn event, the March starts at the corner of Martin Place and Elizabeth Street at 9.00am. The order of the March is confirmed as: WWII Navy, WWII Army, WWII Air Force-Navy, Army, Air Force Civilians supporting Australian Troops-Descendants of Australian Veterans – Commonwealth Troops – Allies. With specific rules in place, the March order is most likely to remain unchanged. Travelling south on Elizabeth Street to Liverpool Street, the website map shows the exact route so you can visually see which points you’ll be viewing, the times and navigation criteria. Marshalls will be positioned in specific areas to assist unit leaders, giving the eyes left command during the Act of Remembrance, observed as units pass the Anzac Memorial. During the command, hats must be removed and the right hand held over the left breast, remaining so until the unit is clear of the Memorial. Additionally, heads are to be turned towards the Memorial when passing. Banners and flags are to be dipped while Delta Force formations salute the Memorial as they pass by. The website rules are specific so keep reading – we’re writing this verbatim to ensure respect for the ANZAC strict guidelines. Wreaths can be laid by Units but must be all completely laid down before 8.15am or after the March. Following the March, at 12.30pm the Commemoration Service takes place at the ANZAC Memorial at Hyde Park. National leaders will be attending this including the Premier of New South Wales and this year, cadets from The Scots College. With a full day of remembrance, a sunset service will take place at 5.00pm at Cenotaph, Martin Place. It’s short yet brings a solemn and dignified conclusion to the ANZAC Day Commemorations. If you were in the service and would like to March, you can contact the organisers to discuss additional details. Eligibility to March includes Services Members of the Returned & Service League of Australia. Descendants of veterans are also invited to March. 2016 commemorates 100 years of ANZAC in Sydney so this March will have additional, milestone significance. As Cremorne Point is a short ferry ride from the Memorial, having a glass of wine overlooking the Harbour from Cremorne Point Manor would be an apt way to reflect on the fallen heroes. Raise a glass in their honour and a moment’s silence, thanking them for their sacrifice, in return for your freedom.